In musical composition, an étude is a work designed to strengthen ones grasp of a particular technique. Concise but technically demanding, each piece allows players to focus on a single facet of their practice, gaining overall dexterity through concentrated efforts. At once artwork and tool, it’s a mode that willfully blurs the lines between aesthetic and function, process and result. As models go, one couldn’t ask for better in assessing the output of Études Studio. 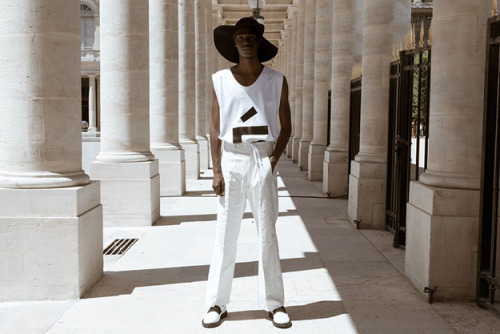 Part fashion label, part publishing house, part creative agency, the Paris/New York-based collective operates as a sort of collaborative meta-brand, grouping a wide range of pursuits into a single, self-referential imprint. Like any good brand, they’re at once reliable and unpredictable: with each of the group’s four members bringing a distinct background to the mix, their work is exacting in finish but agile in focus, fluid between mediums and free to evolve as a reflection of their varying interests. Much of Études’ work is aimed at “hybrid conclusions,” and nowhere is this more evident than in their high-fashion apparel. Bridging traditional gaps between street, sport, and luxury, their bi-annual collections – officially menswear but largely unisex in cut and presentation – are each built on a given theme, the group augmenting their signature silhouettes with inventive fabric blends and prints by outside artists. Their 2015 S/S line, for instance, merges relaxed-cut luxe with motocross gear, energy drink graphics, and the machine-driven imagery of photographer Marten Lange; previous collections have combined Shanzhai logos and workers’ smocks with work by artists like Travess Smalley and Manuel Fernandez. Highly conceptual but always wearable, each is shown in unconventional settings and imaginatively documented, the shots functioning as both ads and artworks. These methods carry over to the studio’s publishing arm, which to date has focused on a series of photo monographs called The Blue Books. Set in cobalt fabric, each volume shares a common format but varies in content, with work ranging from Nicolai Howalt’s car crash studies to Daniel Everett’s architectural abstractions. As in the group’s apparel, the results are at once collaborative and tightly curated, with each step of the printing process treated as a viable medium. The Études aesthetic is nothing if not stylized: precise even in experimentation, they approach fashion as artists, art as designers, exhibition as ad men. It’s perhaps unsurprising, then, that they are regularly hired by outside clients to provide freelance services ranging from photo and product design to comprehensive art direction. The group treats these jobs as exercises – occasions to build strength in new arenas. Crucially, however, they don’t distinguish between the personal and professional: as ever, they embrace the crossover, with insights gained from commercial work poured back into their own projects. In conversation, the group characterizes Études as a global entity – a term which, in a post-internet landscape, suggests an identity defined less by geography than invented networks. It denotes inclusiveness and mutability; it also implies totality, a sphere at once hybrid and whole. In the Études model, all is viable as content and connected in narrative, with various languages combined into a single discourse. As such, it reflects a moment in which, more than ever, our worlds aren’t the settings we inherit, but the spaces we create.